Games are great because they let you do anything or be anyone. You can be Aloy, an adventurous warrior adept at killing robotic animals in a far-flung future. You can explore entire planets and travel through a vast galaxy in No Man’s Sky. In Everything, you can be, well, anything. 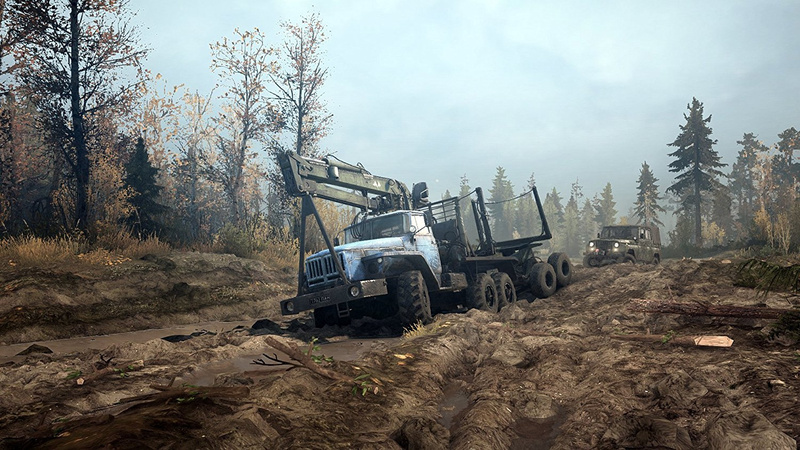 In Spintires: Mudrunner, your goal is to move logs around a particularly muddy patch of land. That’s perhaps a little unfair of us, though. This is an impressive off-road simulation title that, while on the surface may appear dull as dishwater, is surprisingly compelling. 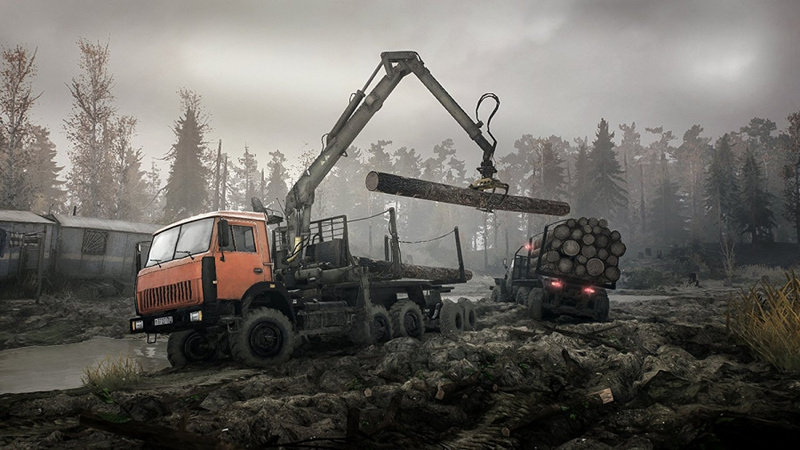 As we said, the basic objective in the main game is to traverse treacherous terrain in heavy duty vehicles, delivering timber from A to B. It sounds like a simple enough task, but there are a number of factors working against you. 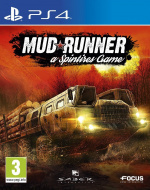 One of them is the brilliant physics simulation at the heart of Mudrunner. The trucks are slow, heavy things with a convincing weight and realistic suspension that reacts as you’d expect to the conditions at hand. Equally, the mud and water react dynamically to your vehicle as you drive. Deep tracks are carved in the muck as you push through, your tires clogging with earth and slipping in the increasingly poor conditions. Water displaces realistically and washes the mud from your wheels. Rivers have currents that can force you off course or tip you over if you’re not careful. You also need to be aware of fuel consumption and damage. In most of the trucks, you can enable drive to all wheels and differential lock to help you get through the worst roads and bodies of water, but doing so uses up significantly more fuel. There are always one or two stations at which you can top up your tank, but they might be out of your way, so you need to manage your fuel sensibly. Damage is a more obvious metric, but it doesn’t take much before you’re in trouble. Unfortunately, control is the game’s main issue. Whether by design or not, the vehicles have sluggish steering, require a deft hand to drive, and are all too easy to oversteer into danger. If you do find yourself stuck in the mud or in need of repair, you can switch to a different vehicle and come to your own aid. At garages you can install various attachments to your vehicle, such as a fuel cistern or a utility trailer, with which you can refuel or repair your previous truck. All vehicles have a winch too, so you can haul yourself out of nasty scenarios. Carrying out these actions can be quite fiddly, as the UI was clearly built with a mouse and keyboard in mind, but options have been mapped to the DualShock about as well as can be expected. Most sticky situations can be avoided with enough planning, however. The sandbox maps are fairly large, and there are many different routes you can take to complete your drive. We tried to stick to the roads as much as possible, but there are no doubt much faster paths to be discovered. There’s good reason to explore environments fully, too - watchpoints uncover blacked out areas of the map, and there are vehicles and garages to unlock, which can make things easier in the long run. Milling around in these dangerous but dreary locations can be a bit of a drag on your own, though, especially as it can take a very long time to make meaningful progress. 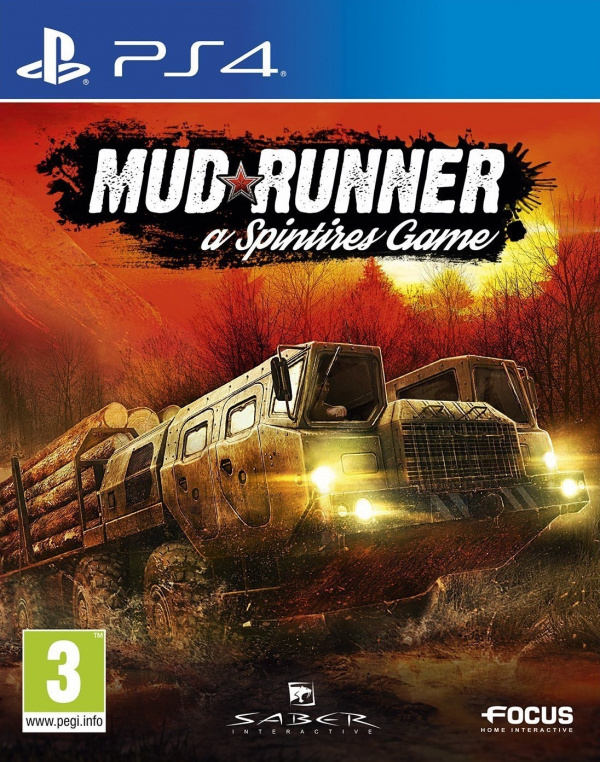 Fortunately, four-player online co-op is included, which is probably the best way to play Mudrunner. With you and a few friends, or even strangers, working together – delivering lumber, refueling each other, uncovering the map etc – it can be a lot of fun, and can bring some much needed levity to an otherwise straight-faced game. Smartly, multiplayer games can be saved in the same way as single player, and you can pick up where you all left off, regardless of the number of players. 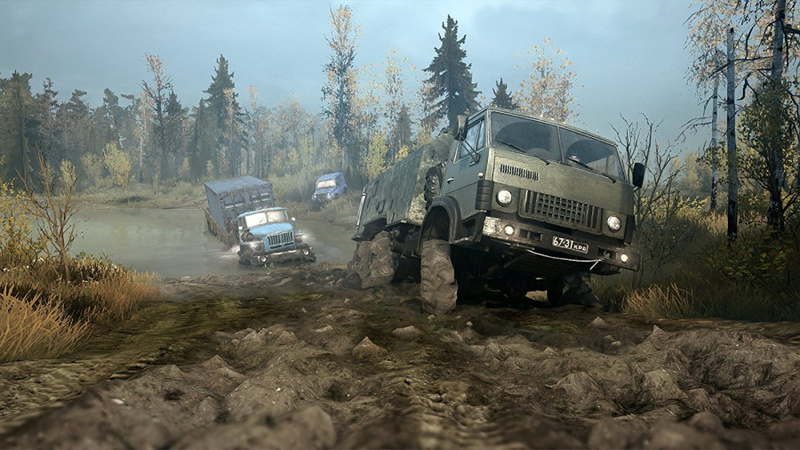 The challenge mode offers smaller, more focused objectives, ranging from navigating a jeep along a steep mountain path to picking up logs from village houses using a vehicle-mounted crane. These can be very tricky, particularly if you want to earn all the stars for completing the optional side-objectives as well. It’s a nice addition that helps to break up the action. If none of this sounds particularly exciting, this may not be a game for you. This is a slowly-paced, at times boring, experience, but as we’ve already mentioned, there is something satisfying about seeing a drive through to its conclusion and overcoming perilous situations to get the job done. 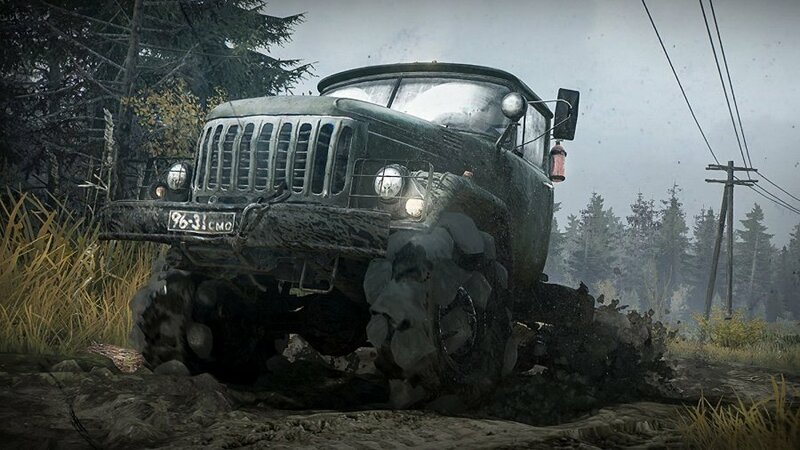 It’s a hard sell, but especially in multiplayer, Mudrunner can provide a more entertaining time than you might suspect. Spintires: Mudrunner is a hard-crusted simulation title that makes you earn your fun through hard work and determination. It’s certainly not for everyone with a crawling pace and a muted aesthetic, but the impressive physics and sandbox design make for some great moments, especially if you’re playing with others. The UI and vehicle handling will have you wrestling for control at times, but if you persevere, this is a game with surprisingly rewarding gameplay and plenty to get stuck into. This genuinely sounds like something I'd really enjoy. I love these kinds of games. Insane, I think I want it. Boring, muted setting, crawling pace. Sounds like my daily drive to work. Picking this up! I mainly commented to say congrats on the sub title. @Wazeddie22 It's a tough one. I'd definitely recommend watching some footage so you can see in more detail what the minute-to-minute gameplay is like. As someone who doesn't normally play these simulator games, it grew on me over the course of my time with it. I'm absolutely loving it. As much puzzle game as driving sim, tough, frustrating, yet rewarding. I spent around 3 hours on the first map yesterday, and with the end in sight I managed to tip my rig onto its side in some particularly deep mud, so had to switch to another vehicle, traverse the map, and winch it back onto its wheels. It was so rewarding, though. Final time was 4 hours 28 minutes. I'm oddly excited for this! A really niche game suprised it got released on console. @Quintumply Did you have any issues with the camera? From some of the videos I've seen on YouTube this game doesn't seem to have your usual (for a driving game) camera views on offer. @Nightcrawler71 The camera does take some getting used to, yes. In the end I just had the camera as high as possible to get the best view of the road ahead. I think the idea behind the funky camera angles is to give you good viewpoints for when you're trudging through tick mud or what have you, but it could be better. @Quintumply OK, thanks. I'm quite interested in picking this up, but will probably wait for it to come down in price. I have more than enough games to keep me occupied right now anyway! @Quintumply Do you know how you can continue a saved multiplayer game with the same people you started it with? I think a demo of this game could help people find out if it's their cup of tea. I'd like to play a demo, but I wouldn't buy this blindly, even if it were on sale. @Nibr07 I think the way it works is that you can save the game you’re playing with others, and you can then jump back in whenever you want, just as with a single player game. From there I believe it opens up a public game so other players can join you. I didn’t try it in a private, friends-only game but I imagine that’s how you would carry on with just your buddies.